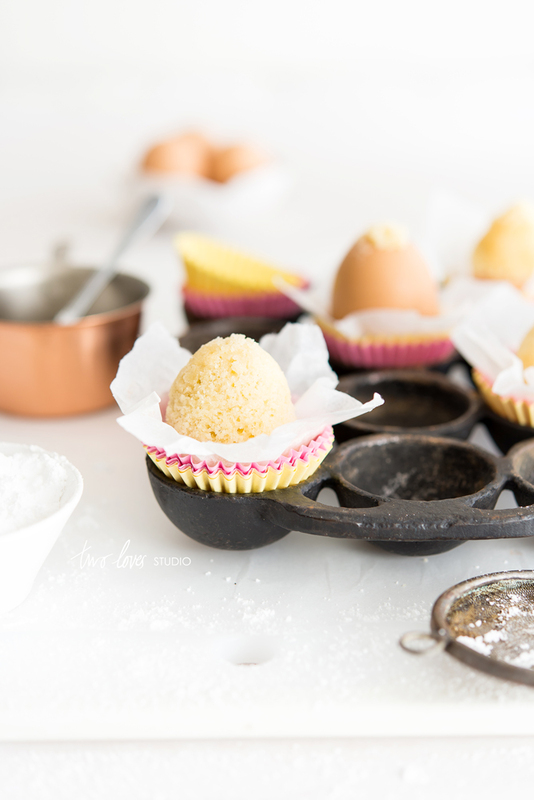 With Easter only a few days away, and all of my time at the moment spent on shooting recipes for the Paleo book, I did manage to put some time aside with Talia to play with some ooey gooey melted chocolate and to bake these cute little egg cup cakes. I don’t usually make an easter recipe, so I thought it might be nice this year as I will be working over the break to shoot the last half of the recipes for the book. But don’t worry, I do have a picnic planned with friends on Good Friday, (which I will be making a dairy free chocolate paleo tart – and I am pretty excited about that), and Matt and I will be attending the Dave Matthews Concert here in Melbourne, which we are even more pumped about! It’s going to be a good week. What are you guys up to for Easter? 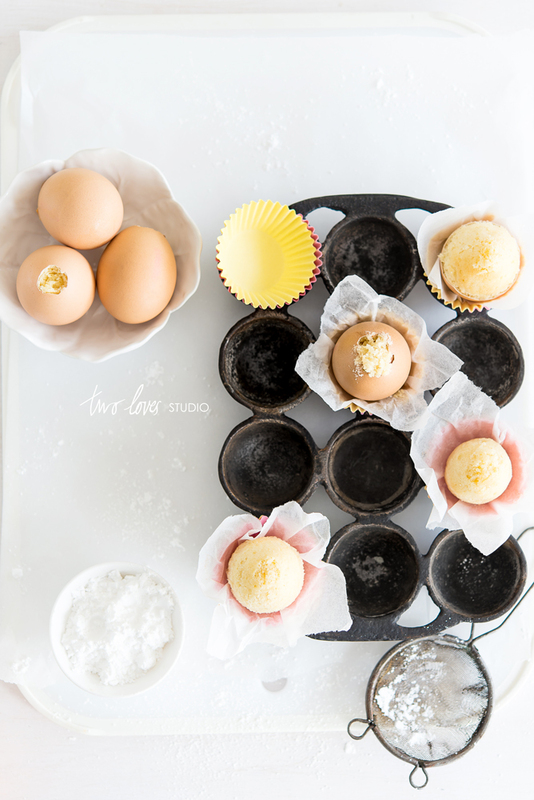 Baking cupcake batter in egg shells is not a new idea, but it is certainly something a little fun, easier than we thought and Talia is always up for modifying her recipes to suit my crazy requests. 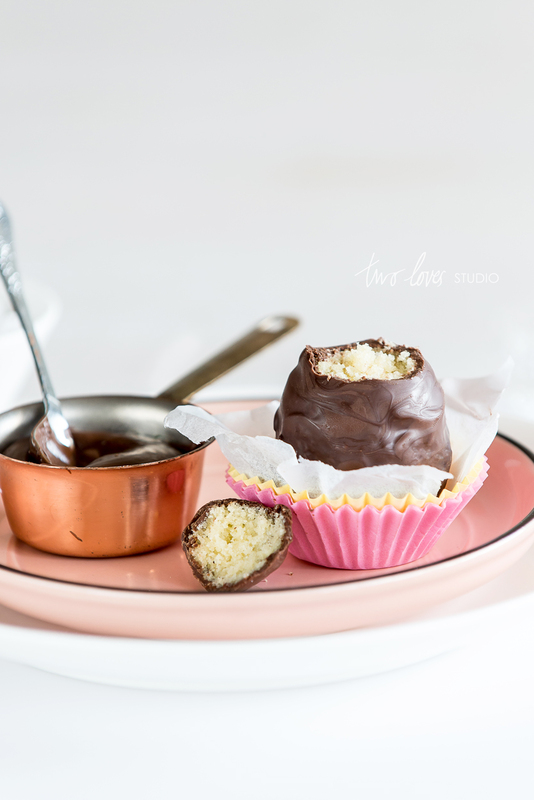 Once the eggs cupcakes are baked, it was really relaxing to sit around with a cup of tea, peeling egg shell off cake and getting messy with melted chocolate. I guess most of my regular readers have noticed that Talia and I have been working together quite a bit lately. As much as I enjoy cooking, there is just something so special about working with another passionate foodie (or baker I should say! ), brain storming ideas, sitting around on the weekend eating and shooting the food we have created together. It’s even inspired Talia to start up her own blog, which I am so pleased about as it is what the TLS space is all about. 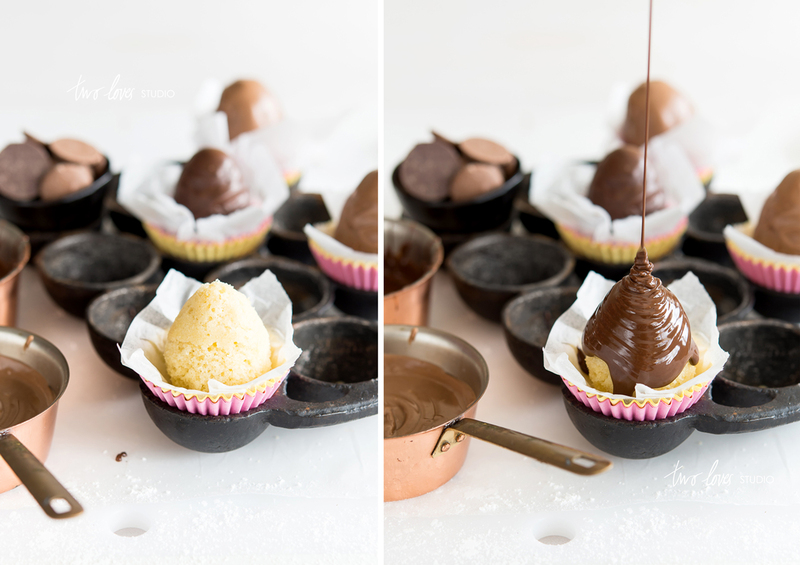 We decided to play with melted chocolate for the egg cupcakes as it is a simple yet classic touch. I love the beauty in simplicity and any of you who have been on Pinterest at the moment looking for Easter ideas will know that they seem to be getting more and more over the top, complex and if I am completely honest maybe even a little (or a lot) corny! You can however think of this as your blank canvas and decorate them however you like, buttercream icing, sprinkles, powered sugar, or a drizzle of maple syrup. Gently poke a small hole in the top of each egg using a cork screw or something with a small/fine sharp point. Carefully remove a small amount of the egg shell so the hole at the of the egg is around 1.5cm (0.5″). Turn the first 6 eggs upside down and pour out the eggs into a bowl. Store these in an air-tight container for use in another of your favourite recipes. With the last egg, empty its contents into a separate bowl that will be used for this recipe. Fill a large bowl with cold, salted water. Rinse out the empty egg shells by submerging them into the water and allow to soak for approximately 30 minutes. Remove the eggs from the water, rinse them in fresh water and leave them to dry upside down on a clean tea towel or paper towel. Make sure they are fully dry before making the cake batter. Preheat the oven to 180 C (350 F ). Loosely line 7 holes of a muffin pan with foil and place the eggs into each muffin hole. Arrange and scrunch the foil around each egg so that the egg will stay upright during the baking process. In a large mixing bowl, place all ingredients and beat with electric mixers on a medium speed until light, thick and creamy. Spoon the mixture into a piping bag, (you can also use a large zip lock bag with a small hole cut into one of the corners). Pipe the cupcake batter into the prepared egg shells about 2/3-3/4 full, (it is best if you can get it closer to 2/3 and not 3/4, or over 3/4 full as the cake batter will spill out and potentially crack the egg. This will result in an uneven shaped cake). Place the muffin pan with the eggs into the oven and bake for 15 minutes. It’s ok if the cupcake batter spills slightly over the top. Remove the muffin pan from the oven and allow the eggs to cool for around 5 minutes, before transferring them to a wire rack to cool completely. Gently peel the egg shell away from the cake and discard. (You can leave this part until you are ready to decorate them, by storing them in an airtight container). With a small sharp knife, shape the cakes as necessary by cutting off any lumps or spillage from the tip of the cake. Now you have your egg cakes to decorate as you like. 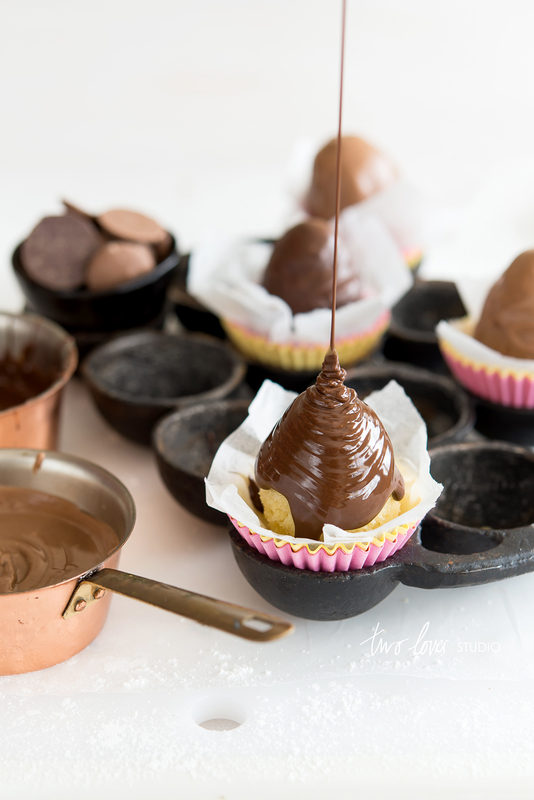 We melted small amounts of dark chocolate and milk chocolate separately, placed the egg cakes in cupcake liners and piped the melted chocolate over the eggs (using a zip lock bag with a hole in it) using a steady stream of chocolate, then set them in the fridge. Don’t worry that they don’t look perfect, it’s all about the fun, getting messy and trying new things. **Why 7 eggs? As one egg is used for the recipe, it leave you with 6 eggs to use in other recipes or enough to make an omelette. Inevitably one is going to go wrong, so we has a buffer of one and if it all works out, then great you have an extra egg to play with! I love this, it´s elegant, creative – and not so over the top as many easter ideas I´ve recently seen – completely agree with you on that! The real difficulty is to keep it simple, yet original AND delightful, think you did just fine here! Thanks! Gorgeous pictures, as usual – and I’m totally impressed with the egg shell idea. I’d prefer a muffin egg any day over a typical chocolate egg! These are so gorgeous, how clever to use the egg shells to make them in, perfect shape for Easter. These are stunning! I’m not much of a baker (give me savory any day! ), and while I knew about baking savories in egg shells, never cupcakes! Of course this from the woman who hid undyed eggs and the kid who still has to find one! Yes I saw that on Instagram – made me laugh! SO clever!! They look delicious–I want to eat one right now! This is BRILLIANT… truly BRILLIANT!!!! !